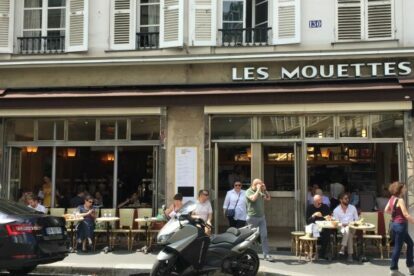 If you happen to like the area around “le bon marche” department store as a shopping area, I recommend you take a break at Les Mouettes. This is a typical French bistrot from the 1970s-80s (if you go to the toilets you will see that they really look like they’re from that time; authentic vintage). It’s got honest, simple bistrot food which does not attempt to be anything else, but in big quantities and fantastic flavours. I specially recommend the chicken club sandwich (one of my favourites when talking about pub food) which come in 3 layers of bread with chicken breast, tomato, lettuce, egg and some very nice mayonnaise. It is a complete meal in itself and not deceiving at all. Apart from that, all their other dishes correspond to what you can expect in a French bistrot. The reason I like it is not only for the good food but also the excellent location in rue du Bac, next to the Grande Epicerie and in front of the design shop Conran, which is a fantastic area to walk around in on a Saturday morning. The waiters, two sweet ladies, are helpful and always smiling. What else can you ask for? Offline Paris tips? Get our iPhone / Android app!